Elisabeth Rehn was born in Helsinki, Finland. She was the parliamentary leader of the Swedish People's Party from 1987 to 1990, and was appointed Defense Minister in 1990 serving until 1995. Rehn also served as the minister of equality from 1991 to 1995, after which she became a member of the European Parliament from 1995 to 1997. Minister Rehn ran twice for President of Finland, first in the 1994 and was narrowly defeated by Martti Ahtisaari in 2000. As the first female Minister of Defense of Finland, she had a high profile. During Rehn's term, a law on voluntary female enlistment was enacted. 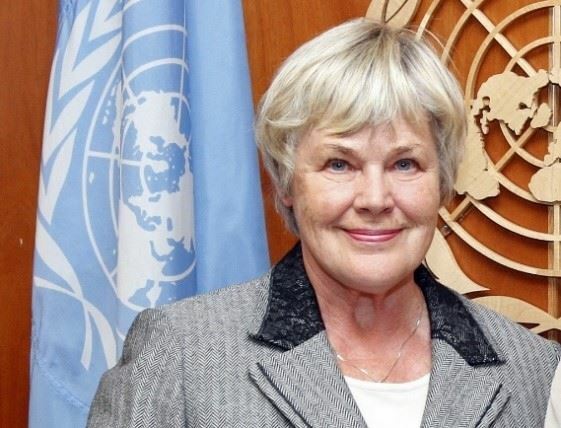 Rehn is known for her international assignments as United Nations Undersecretary General (1995 - 1999) working with UN Secretary Kofi Annan, and as the special rapporteur for Human Rights in Bosnia and Herzegovina (1998-1999). Rehn has a master of science degree in economics and received two honorary degrees in political science from both Hanken School of Economics and Åbo Akademi University. Elisabeth Rehn is a Member of the Global Leadership Foundation, a not-for-profit organization composed of former heads of government which works to support democratic leadership, prevent and resolve conflict through mediation and promote good governance in the form of democratic institutions, open markets, human rights and the rule of law.